Do you have a young woman graduating from college this Spring or Summer and need some affordable gift ideas? How about giving them a head start with one or all of the following books from 4 enterprising, accomplished and successful women for under $20? Sheryl Sandberg’s Lean In for Graduates is an invaluable handbook for any woman entering the workspace for the first time! 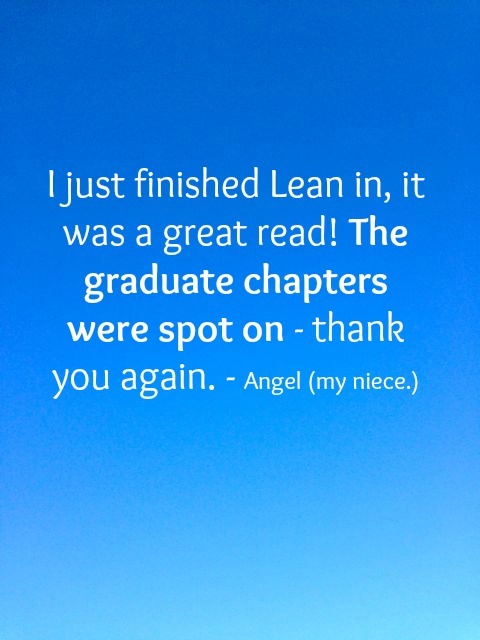 It not only includes the full text from the original Lean In book, but also has been updated with insightful content to meet the needs of recent graduates. From getting your first job and negotiating tips to overcoming your fears and real life stories from other women, this book is sure to get your graduate off to a great start. Want to really motivate your graduate to go for their dreams? Then #GirlBoss is a must have! In her first book, Founder and CEO of Nasty Gal, Sophia Amoruso tells her amazing story of how she bootstrapped her vintage clothing line idea to success using unpaid social media and propelled it to a $100 million company today. She is proof that it doesn’t matter what school you go to or background you come from, what matters most is how you apply yourself. Truly valuable advice for any young woman. Wouldn’t it be great if someone reassured you at the beginning of your career that it’s okay to fail? Might you have been less risk averse? This Publishers Weekly Top 10 Book in Business & Economics of 2014 by Jessica Bacal features workplace stories from 25 highly successful and influential women who have become great leaders because of the lessons they learned from mistakes they made earlier in their careers. My mom always used to say that there is no such thing as a bad experience because whatever you take away from it will only make you a stronger and better person (that’s of course if you choose to learn from it.) In my opinion, this is probably one of the most basic and fundamental survival skills to have as a young woman and throughout your life. This New York Times Best Selling book by the founder of The Huffington Post, Ariana Huffington, challenges women to take better care of themselves. Simply put, sleep more, nourish and nurture your mind, body, and spirit and success will follow. Truly great advice for young women who may feel that the only way up the corporate ladder is to work 24/7 and neglect their personal well being. I gave my niece who is graduating at the top of her class this week a copy of Lean In for Graduates and she was thrilled! After my experience with the original book, I figured that this 2nd installment of Sheryl Sandberg’s New York Times Best Seller was going to be just as insightful (see our post on this book by clicking on this link: Lean In) and give her the tools she needs to navigate not just her workplace, but also her career and personal life. Congratulations to all the young women graduating this year! We hope that these books inspire and empower you to pursue your passions and achieve your goals while finding a balance between your professional and personal lives. Do you have any gift ideas that you would like to share? Leave your comments below. We always love to hear what you have to say. Stay inspired.